Meet our newest Babe of the Month, Miss Bryona Ashly! Bryona has been attending a number of hot rod shows with me including Mooneyes Japan, Grand National Roadster Show and most recently, the Sacramento Autorama. She is currently featured in my 2018 calendar as Miss December. Bryona has both dedication and passion for modeling. She brings a professional attitude along with her playful nature to every shoot. Be sure to follow this lovely lady on her upcoming adventures and check out more of her work. How did you get into modeling: I started out modeling by taking photos for fun with a local photographer from my hometown and posting the images to my social media. I quickly had photographers contacting me wanting to work together and it snowballed from there. What was your first modeling gig: My first “official ” modeling job was shooting with an artist by the name of Scott Hove. I modeled at his art installment called Cakeland. What are some current projects your working on: I recently shot an amazing cosplay for new merchandise I am working on inspired by the great Ed ” Big Daddy ” Roth’s creation Rat Fink. What do you enjoy about modeling: I really enjoy the whole process but my absolute favorite thing about modeling is being able to meet new and interesting people. What sort of preparation goes into your photo shoots: Well the amount of preparation varies depending on the type of shoot I am doing. If I am shooting product work then it’s usually at least nails , hair , and face. If I am shooting something that I have collaborated on and is for my own portfolio or for merchandise then I usually will spend a couple days picking out wardrobe, looking at different hairstyles and makeup and the biggest thing that I have to prep is my mindset. When you feel good you almost always photograph good. I like to listen to upbeat music and really get myself in positive state of mind. What photographers do you enjoy working with: I have had the pleasure of working with numerous talented photographers but some of my favorite photographers I work with are Mitzi Valenzuela, she shoots the majority of the photos I take with classic cars and hot rods. We have been working together for almost a year now and it’s a relationship I am extremely thankful for. I also really enjoy working with Alonza Photography. He is someone I just started working with but his attention for detail and styling skills are out of this world. And lastly is Le Mew Photography. She shoots a lot of the fetish work I do and I have been working with her for almost two years now and is a dedicated photographer who definitely knows her stuff! Where can we see some of your work: I have been published over 50 times by independent magazines such as Car Kulture DeLuxe, Delicious Dolls magazine, and Campout Magazine. I have shot images for various brands of clothing and lingerie and can see my images featured sites like Pinup Girl Clothing, Playful Promises, and Artifice Clothing. Tell us about your trip to Japan: Oh my goodness where do I even start ?! It was amazing. I was lucky enough to travel to Japan with Mitzi Valenzuela and sign merchandise and do photoshoots at the Mooneyes Custom show in Yokohama Japan. After that we traveled to Tokyo to shoot with a Japanese pinup clothing brand called Psycho Apparel and then got to spend a day at Disneyland before flying back to the states. I fell in love with the culture, country, and most of all the people. Their kindness and respect for their country is unparalleled. I cannot wait to return. Upcoming travel plans: I am taking a trip to Germany and possibly Paris this coming March. I will be traveling to Las Vegas Nevada in April for Viva Las Vegas Rockabilly Weekender and car show. Then I will be traveling to Utah to the Bonneville Salts Flats in August. Then back to Japan in December for the Mooneyes Customs show in Yokohama. You recently attended Grand National Roadster show tell us about the show: Grand Nationals was a blast. It was my first time attending the show and it might be my favorite show in California. I was just astonished by the amount of cars that attend that show and the quality! I didn’t even make it to all of the buildings! You also attended Sacramento Autorama how did that show differ from GNRS: It was my first time attending Autorama as well. The only thing I really took a notice of was two things, One was the amount of cars that was of attendance at Autorama there was definitely less that at Grand Nationals. Secondly I noticed that the low rider scene was much more present at Autorama than at Grand Nationals. Do you have a favorite custom or hot rod: My favorite custom car is The Orbitron, this car has an interesting history. Originally built by Ed Roth then later found in Juarez Mexico in the early 2000’s in front of an adult bookstore. 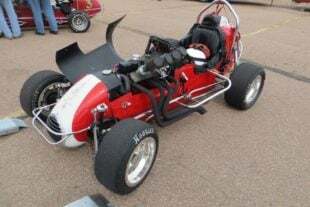 Beau Boeckmann of Galpin Auto Sports purchased it from the family who owned it and Dave Shuten did the restoration returning The Orbitron to its full glory. Favorite music or band: I honestly enjoy so many kinds of music it is hard to say what is my favorite. Anything made before 2000’s is what I usually listen to. I cannot connect with music that is coming out these days. Favorite drink: Shirley Temple. I don’t drink alcohol really. Current goals: My current goals is to just keep working and making new connections. I am a workaholic so I am always trying to get bigger and better jobs.